A Sept. 14th report in the Independent, by Alexandra Sims, on Benjamin Netanyahu’s recent visit to the Netherlands focused on two elements of the trip: A Dutch MP who refused to shake hands with the Israeli prime minister and statements by the Dutch PM about BDS at a press conference with the two leaders. The report leads with the video showing an anti-Israel Dutch MP refusing to shake Netanyahu’s hand while in a meeting at the Dutch parliamentary affairs committee. Video has emerged of a Dutch MP wearing a Palestinian flag pin refusing to shake hands with the Israeli Prime Minister Benjamin Netanyahu. Tunahan Kuzu, a former Labour MP who founded the multi-ethnic, pro-immigration party Denk (Think) in 2014, made the gesture before Mr Netanyahu attended a meeting in The Hague with the Dutch parliamentary affairs committee while on a two-day visit to the Netherlands. Of course, the video actually “emerged” over a week ago. Moreover, contrary to the Indy’s attempt to paint the party as progressive, Denk has been characterized in the Dutch media as far-left and pro-Erdogan. Kuzu himself reportedly refused to condemn the arrest of Turkish-Dutch journalist in Turkey, who was arrested for “insulting” the Turkish President. This context – omitted by the Indy – helps explain the MP’s decision not to shake the hand of the Israeli leader. In a statement posted to Facebook, Mr Kuzu said his gesture was intended as a protest over the abuses committed against Palestinian civilians living under Israeli military rule in the occupied territories. Mr Kuzu added that following the incident on 7 September, he confronted Mr Netanyahu away from the cameras with pictures purporting to show Palestinians being abused in Gaza and the West Bank, including one of a 12-year-old boy placed in headlock by an Israeli soldier, The Intercept reports. 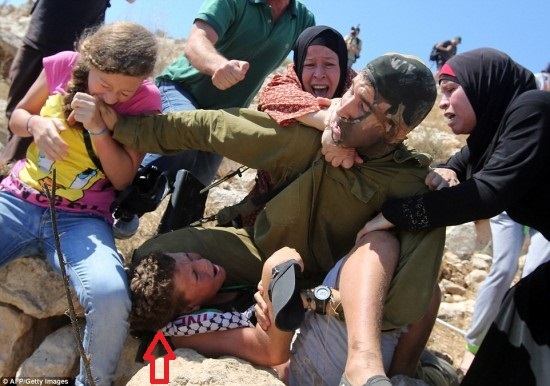 The boy seen in the photo being held by Kuzu, actually 13, was a rock thrower (at one of the weekly staged riots in the West Bank town) temporarily detained and later released by the soldier after being attacked by the boy’s friends and relatives. During the visit Dutch Prime Minister Mark Rutte said in a speech that his government was calling for an immediate end to the creation of Jewish only settlements in territory seized by Israel and that the country would not prevent citizens from taking part in Palestinian-led boycott, divestment and sanctions movements against firms that aid Israel’s occupation. However, the Indy’s characterization of Rutte’s comments about BDS are, at best, extremely misleading. Though the Dutch PM did condemn settlements, Simms cherry picks his comments on BDS to make it seem that he wasn’t critical of the movement. Here’s the part of the press conference where he delivers his remarks on BDS. His government firmly opposes BDS, including boycotts of the settlements. The ‘international’ BDS campaign does not have the Dutch government’s support. His country will not fund BDS activities targeting Israel. His government is in fact working to strengthen their relationship with Israel. Once again, the Indy has exaggerated the impact of BDS and significantly skewed the facts to reinforce the increasingly absurd media narrative that Jerusalem is facing ‘increasing international isolation’. Why do you call the crypto-Nazi Independent affectionately ‘Indy’? The pride pro-Palestinians have in treating Israelis like dirt is the primary reason why pro-Palestinians are considered incapable of delivering peace. Of course, pro-Palestinians are mostly too stupid to understand how stupid they are. This post was actually pretty kind to the not-really-Independent, since the paper blovated at length about the far-Left bile over the PM’s visit to the Netherlands AND not only gave some lunatic who was the Dutch PM around 200 years ago an approving quote space (he said Bibi was a war criminal who should have been tried at The Hague, not hosted by the government) but opened the door to link to their previous coverage of said lunatic ex-PM (where the Independent ignored that the current Dutch government stated, multiple times, that no one gave a damn what the lunatic thought; they simply included a pro-Israel Dutch group’s comment to make it seem like this was a policy argument, much as the current U.S. press is covering the Presidential election as if Hillary Clinton and Donald Trump are both sane). The problem with The Independent is that since it stopped publishing a ‘newspaper’, which had a very small circulation, and is now digital only, its website is very successful. As a supplementary the newspaper circulation figures for August 2016 can be seen via this link, and although The Independent is no longer part of these figures, if you scroll way down to the bottom of the table you will come to the circulation figures for The Guardian. For those who have looked at the table you will have seen that The Guardian circulation figure for August 2016 is 157,317. To give some context to that figure, when CiFWatch started back either n 2008, or 2009, The Guardian circulation figures then were; July 2008 337,917 and for July 2009 328,773. The Independent circulation figures for July 2008 was 235,289 and for July 2009 189,013. So when CiFWatch started, either in 2008, or 2009 The Independent which no longer publishes a newspaper and exists as a website only had higher circulation figures than The Guardian does now. How much longer will there be a print version of The Guardian? As long as bird cages need liners to catch droppings, there will be a need for the print version of Der Guardian. I wouldn’t trust Der Guardian to wrap fish. The paper is too toxic. And to think C.P. Scott supported at least the general idea of a State of Israel. I read a lengthy biography of Scott a few years ago — The Guardian has declined so far it’s no wonder the “Stuermer” and “Al Guardian” jibes are stated. It has become, too often, the kind of unconscionable outrage it supposedly advocates against — and I am a “convinced” democratic Leftist! What does the above mean, in English? Would this politician refuse to shake Obama’s hand? Early Thursday, police said the person killed was 13-year-old Tyre King. Detectives investigating the shooting scene said they found what appeared to be a handgun, but “upon further inspection, it was determined to be a BB gun with an attached laser site,” according to a statement from the Columbus police. Mind you, I too would refuse to shake the hand of the vile Obama. Related issue: even one rock well aimed brought down Goliath when thrown by the likes of David, as the story, or history, or myth, or “teaching story,” has it. Throwing even one rock, well-aimed in a morally wrong cause, much less a kind of sporadic torrent of rocks, arguably poses an imminent threat of death and/or great bodily harm to both innocent bystanders, the throwers themselves, and the lawfully constituted local police and military. It isn’t astrophysics to grasp the issues and considerations here, it’s not even akin to counting out the multiplication table. That’s why You’ve Got to be Carefully Taught. Nota bene: enter “You’ve Got to Be Carefully Taught” in search engine, you’ll see what’ goin’ on if you did not already understand. So, it’s based on irrational hatreds of centuries, spurred on by some of the most irresponsible and downright evil persons — term used advisedly — on this planet, in all its history. They have no excuse to claim their “traditions” forced them to become morally evil agents — if that ever was remotely valid. Notice you can (to my understanding) follow all of the traditional Jewish commandments as well as all the dietary rules, without dreaming of harming one hair on the head of one person who has not personally wronged you or the wider world. Would that all religious teachings were understood and practiced in that spirit, a la Martin Buber’s magisterial I and Thou.